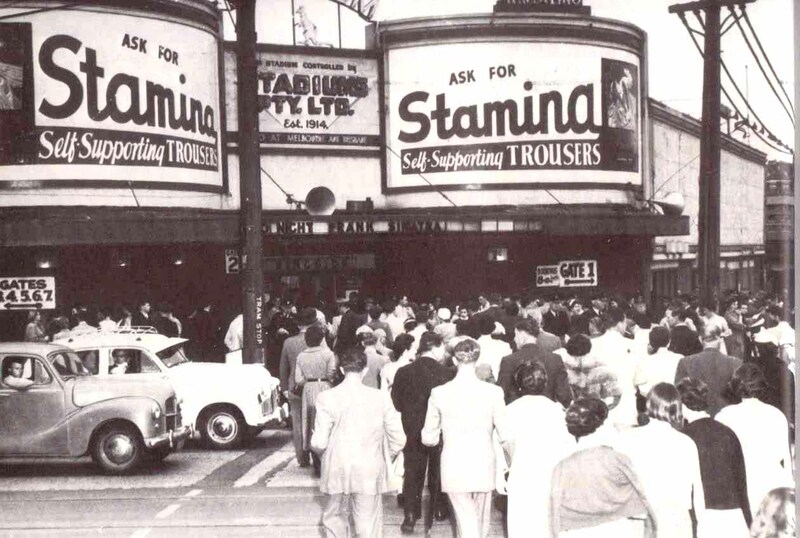 "The Old Tin Shed" in its mid-1950s heyday, with crowds flocking to see singing star Frank Sinatra. "Never in the history of showbiz, in any major city anywhere in the whole wide world has there ever been anything like it for a big night venue -- whether it be a world championship boxing stoush, dwarf wrestling, roller derbies, religious revivals, pop and jazz concerts ... you name it. The Stadium ... was just something else. It was uniquely Oz. Uniquely Sydney. Nowhere else was there or could there have been a joint like the Old Tin Shed." In the middle of 1908 Sydney promoter Hugh Donald Macintosh leased a vacant lot in Rushcutter's Bay, just east of the city centre. The site, a former Chinese market garden, was aquired on a lease of �per week over three years. Macintosh then quickly built a stadium to promote major boxing matches. The Stadium -- which was at first unroofed -- opened with a few exhibition matches, but the first major bout, on 24 August 1908, was between Canadian world heavyweight champion Tommy Burns and Australian champion Bill "Boshter" Squires, which Burns won by a knockout in the thirteenth round. These early big fights proved extremely popular and vastly profitable for Macintosh. His take from the Burns-Squires fight alone was �,500 -- which would probably equate to at least a million dollars today. Macintosh then hired a stadium in Melbourne and put Burns up against the Victorian title holder Bill Lang; Burns was knocked down in the second round but according to legend the referee, Harry Nathan, took 16 seconds to count to eight, giving Burns time to recover and regain his feet, and he went on to win in the sixth round. Macintosh then hosted a victory party for Burns at the fashionable Adams Hotel in Pitt St, Sydney. This Sydney landmark stood on the site now occupied by the Hilton Hotel; its famous Marble Bar was saved from destruction when the Adams was demolished, and was reinstalled in the Hilton. During the dinner, Macintosh reputedly asked Burns how much he would want to take on the leading contender, Jack Johnson, to which Burns replied "�00". Macintosh immediately agreed, earning himself the nickname "Huge Deal" Macintosh. On Boxing Day 1908, Burns defended his heavyweight title against the legendary Johnson -- the first African-American to try for a world title in the class -- at the Stadium. This fight provoked tremendous interest in Sydney for a number of reasons. There was a current fad for all things American, due in part to the recent visit of the United States 'Great White Fleet'; there was also the 'novelty factor' of Johnson's ethnic background, since he was almost certainly one of the first African-Americans to become known by name in Australia; underlying this were racist anxieties in some quarters about Burns' possible defeat and what that might mean for the so-called "white race". All this combined to draw a huge crowd to the fight. According to the Australian Encyclopaedia, Johnson was paid �500 but when he saw the huge crowd in the Stadium on the night, he refused to go on until he was paid more money. Macintosh then allegedly drew a gun and forced Johnson to enter the ring. The fight was stopped by police in Round 14, when Burns was knocked out, and the referee awarded the fight on points to Johnson. The Stadium was roofed in 1911. In 1912 it was acquired from Macintosh by his partner, sportsman and boxing champion Reginald "Snowy" Baker (1884-1953) and his brother Harald. In the meantime, Baker had built several more venues in other cities including the Melbourne and Brisbance Stadiums (later both renamed Festival Hall). In 1914, the Baker brothers formed a new company to run the venues, Stadiums Pty Ltd, with Richard Lean and 'prominent Melbourne business identity' John Wren (1871-1953) as its other chief shareholders. War restrictions closed the Stadium in 1916, and it reopened in 1919. Many World Championship Boxing and Wrestling title bouts were held there and it operated most nights of the week, becoming one of the most popular venues in Sydney from from the 1920s until its closure in 1970. Boxing and wrestling matches were always the Stadium's "bread and butter" but from 1955 onwards it began to be used increasingly for music and stage productions, since it was the only large-capacity indoor venue available in the city at the time. The man responsible for turning the boxing mecca into an international entertainment venue was expatriate American promoter Lee Gordon. He imported scores of major stars to play at the Stadium, including some of the most famous jazz artists of the era, and world-famous popular singing stars like Frank Sinatra and Johnny Ray. He also promoted many shows with the rising stars of the local scene like Johnny Devlin, Col Joye and Johnny O'Keefe -- who often supported the touring acts -- and from that time on, Lee Gordon and the Stadium were virtually synonymous. In the late Fifties Gordon made his name with his legendary series of 'Big Show' concerts -- star-studded events headlined by big American names, with Australian acts supporting. Through these shows, Gordon almost single-handedly launched the first wave of rock in Australia, touring a host of groundbreaking rock'n'roll and R&B acts including Little Richard, The Everly Brothers, Bill Haley & The Comets, Duane Eddy, Eddie Cochrane, Johnny Cash, Jimmie Rodgers, Gene Vincent, Buddy Holly & The Crickets, LaVern Baker, Big Joe Turner and Chuck Berry. Physically, the Stadium -- affectionately known as "The Old Tin Shed" -- was roughly circular in shape, with raked wooden seats facing towards the central stage. The venue seated between 10,000 and 12,000 people. Built with an iron and wood frame rising on a brick base, the roof and walls were covered in corrugated iron, which was unlined and uninsulated. This created a formidable echo and often made music and lyrics difficult to decipher, although it proved to be well-suited to providing a fascimile of the 'slapback' echo found on many rock'n'roll records. Once the audience started screaming, the reverberation made it impossible to hear anything, even on stage. At The Beatles' concert there in 1964, one Sydney newspaper sent along a sound engineer, who reportedly monitored the sound level from the hordes of screaming teenyboppers at well over 100 decibels. The building had no air-conditioning or forced ventilation and its metal skin often made it unbearably hot in the sweltering Sydney summer -- which of course was one of the peak periods for concerts, since it coincided with the annual Christmas holidays. In one case, members of the troupe accompanying "Samurai" star Koichi Ose collapsed and had to be treated for heat exhaustion during their December 1965 performance. The Stadium was an 'in-the-round' venue, with a circular stage in the centre of the hall. This could be slowly rotated so that the performers could be seen by everyone as it turned. The stage rotation was not mechanical, however -- it was actually pushed around by stage hands -- and the rotating stage was typically moved around a quarter turn or so at a time, and left in that position for a few minutues. Many performers nearly fell when the stage was rotated, as the motion was often very jerky. Bob Dylan reportedly had to ask one of his band to catch him, and The Small Faces incurred the stage hands' ire when lead singer Steve Marriott reportedly abused them -- in retaliation the stage was left in one position for most of their performance. The Sydney Stadium's final concert presentation was The Four Tops, supported by The Flying Circus, on 1 June 1970. The building was demolished in 1973 to make way for the overhead section of the Eastern Suburbs Railway. Its former site is now marked by a commemorative plaque. Do you have more information about the Stadium?